When I get finished writing this article I’m heading into the garage and hook up my Hobie Pro Angler 14 kayak because I’m heading to Folsom Lake at o’dark thirty in the morning in search of trout and kings. With all the cold stained water that has pushed in the lake recently, you may be wondering, why Folsom? Well that’s easy. 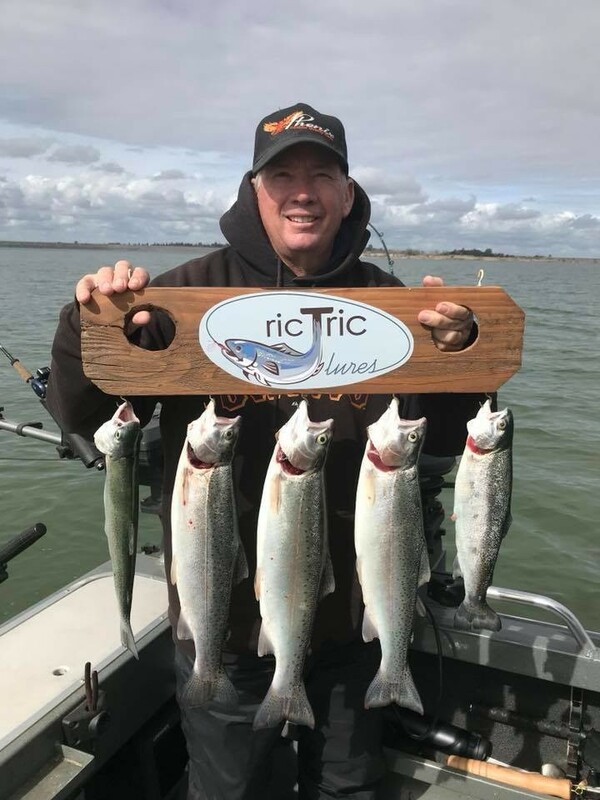 Despite the fact that the conditions seem all wrong with the water cold and stained and the lake level fluctuating wildly over the past month or so, my buddies have been hooking some really nice fish while trolling Folsom’s north fork and main body. One guy I’ve spoken with this week is Captain Jerry Lampkin of T.N.G. Motorsports Guide Service. Jerry has been doing fair to well at Folsom for about a month, although right this minute he’s down in Mexico enjoying some fun in the sun. The other guy I chatted with was Mike Kielty. Mike is great troller as his fishing partner and Kokaneemart.com founder Ric Brown. Like most of us, Mike and Ric had been waiting out the weather waiting for spring fishing to kick off. Finally, this week they couldn’t take it anymore and decided to hit Folsom despite the less than optimum conditions and guess what? They smacked some really nice rainbows. Here’s what Jerry and Mike had to say about their recent experiences at Folsom. “I’ve been spending most of my time in the lower end of the north fork, but at times I’ve headed down into the main body hoping to get into a good size king or two. So far, the kings we’ve landed have been pansize, but I know one guy that got a 6 pounder the other day on a chrome and chartreuse Speedy Shiner,” Lampkin exclaimed. “My approach to Folsom is always about the same. I either troll at 3 mph or 1.5. When I’m trolling fast, I’m pulling Speedy Shiners. When it’s time to slow down I like Wee Tads, Wiggle Hoochies and threaded ‘crawlers trailing behind a Sep’s Side Kick. I use different colors of Side Kicks, but watermelon is probably my favorite. With the Speedy Shiners copper and copper orange have been working well, but you’ll want to play around with different colors to see what they want on any given day,” Lampkin tipped. Clearly when Jerry hits Folsom he is planning to catch fish. Mike on the other hand was sort of planning to get skunked when he and Ric visited the lake. “Surprisingly we got our fish on bigger lures. I was running a 3-inch silver Speedy Shiner when that first fish hit and I stuck with that lure throughout the day. We experimented with Ex-Cels and some other stuff, but the big Speedy Shiners were the ticket,” said Kielty. “The water in the main body was a little stained by very fishable. In the south fork the water was pretty muddy. So, muddy in fact that we didn’t try fishing over there. We ran over there thinking about looking for kings, but that mud scared us back to the main body. We found some marks and tried rolling shad near them. If the marks were kings, they weren’t interested,” Kielty shared. “The fish are spread out. Our larger fish came between 22 and 40 feet deep. We actually caught two fresh planters while letting our lines out behind the boat. The planters were pretty enthusiastic. They must have been hungry. In the end, we finished up with 5 rainbows, tossed a couple back and missed a few more. Three of the five were solid chrome bright holdovers and two of them were pansize planters. It was a fun day that for sure. It was good getting on the water after being stuck inside for so long and it’s always a pleasure being on a boat with Ric,” Kielty exclaimed. To find out how Wes Ward and I do at Folsom you’ll have to wait until next issue. The last time we were out there we peddled for 9 miles and got one rainbow between us. Therefore, I’m taking the Mike Kielty approach. I’m looking forward to being out on the water and we hook some fish, it will be a bonus. You’ve got to start somewhere and this is going to be our first kayaking trip of the 2019 season. Look out fish, we are gunning for you! Finally, if you want to hit Folsom with somebody that really knows what they are going, jump aboard Jerry’s boat. 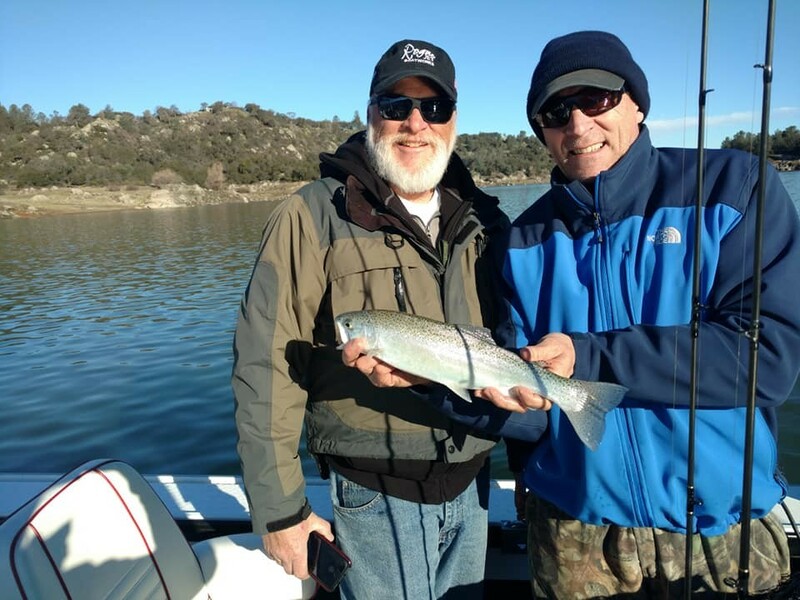 Not only is Jerry a fun guy to fish with, many consider him the top stick on Folsom when it comes to catching rainbows and kings. Once again Jerry’s operates T.N.G. Motorsports Guide Service. You can find his ad in the pages of the Fish Sniffer or look him up online.